The World Health Organization Regional Office for Europe recently published a new report, Food Systems in Correctional Settings, which examines the critical role of food in the physical and mental health of incarcerated people and the construction of their identities and relationships. In this expert blog for PRI, the co-author of this report, Amy Smoyer, introduces the report, highlighting in particular the psycho-social importance of food. In the United States, where most prisoners are served meals that are prepared in a central kitchen, alternative cooking and food activities are largely prohibited but very common. Working in small groups in the housing units, people use hair dryers, hot water, pillow cases, and trash bags to prepare a wide array of dishes with food gathered from the cafeteria, purchased at the prison store, and smuggled out of the kitchen. While institutional policy bans all group cooking activities, and the use of supplies (like trash bags or hair dryers) for anything other than their original purpose is grounds for disciplinary action, correctional officers often turn a blind eye towards these cooking projects. On special occasions, women in the US prison where I volunteer prepare an elaborate dessert they call the ‘Fatty Girl Cake’. Using aluminum foil taken from the kitchen, the women line the inside of the cardboard top of a board game. Then, a group leader designated as the cook arranges several dozen packaged snack cakes in this ersatz pan. Peanut butter, marshmallow fluff, butter, and melted Hershey’s bars are used to mold the different ingredients into a single loaf. This process can take days and the cook may stay back in her cell during recreation time or meals to ensure the project is done correctly. To be the lead cook on this type of project is an honor. Upon completion, the cake is cut and shared with all who have contributed supplies to its construction, and anyone else who the group feels is deserving of inclusion. Exclusion from this type of cooking activity sends a harsh message that speaks to the rejected individual’s place within the prison’s social hierarchy. Would you like to eat an oatmeal crème pie smashed into the corner of a Scrabble box, attached to a chocolate Swiss roll with peanut butter, and drizzled with chocolate that was melted with a hair dryer in a plastic trash bag? Maybe. Maybe not. But the value of the ‘Fatty Girl Cake’ is not really culinary. The ‘Fatty Girl Cake’ is about creating community, marking time, and pushing back against the rules of confinement to create a self that is momentarily free. If you were in prison, you would want a big slice of that dessert. 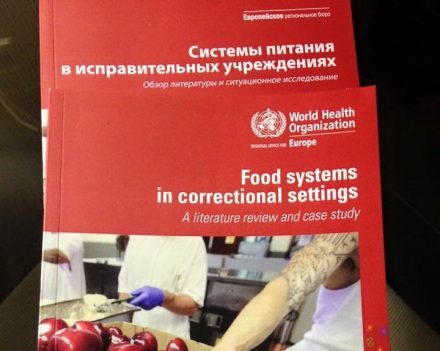 A new publication from the World Health Organization’s Regional Office for Europe, Food Systems in Correctional Settings: A Literature Review and Case Study, explicates the multiple ways in which food impacts the physical and psycho-social health of incarcerated people. The paper begins with an inventory of food settings in correctional institutions, encouraging readers to look beyond the cafeteria and prison shop to consider other places where food is consumed and utilized: housing units, workplace and educational settings, and visitor spaces. Next, existing research about the meaning and impact of food in correctional settings is presented and summarized. The implications of food on physical health is obvious: Malnutrition in prison settings may produce either overweight and obesity or underweight, depending on available resources. While data on prisoners’ weights is scarce, studies indicate that weight trends in the community tend to be reproduced inside the prison walls. In addition to poor diet, unhealthy weights among incarcerated populations are related to limited access to physical activity and the use of psychotropic medications. Perhaps less recognized is the impact of food on psycho-social outcomes, including perceptions of self and relationships among inmates and between inmates and staff. The report describes how food becomes a powerful tool for identity-making in correctional settings where institutional policies minimize opportunities for the articulation of self. Specific food selections may be made to reinforce cultural, ethnic, and/or religious identities. Male and female roles are also constructed through what one eats and the negotiations between prisoners about who cooks and cleans. The preparation and sharing of food is used to build relationships among groups of inmates and organize hierarchies within these group. As prisoners engage in activities that dwell in a place between behaviors that are strictly prohibited and rules which are not enforced, the community explores the discretion and vulnerabilities of staff power. As we see throughout prison life, and in the example of the women’s ‘Fatty Girl Cake’, staff and prisoners are constantly negotiating what behaviors will be permitted at any particular time and place. The final section of the report is dedicated to describing food-related interventions and innovation in correctional settings. For example, educational programs that teach culinary skills, nutrition, and food budgeting offer expertise that is useful both inside and outside the prison walls. A case study highlights food initiatives in Danish prisons that have replaced central kitchens with self-catering systems. In these food schemes, incarcerated people shop and cook for themselves. The paper closes with 7 Action Steps that correctional staff, community advocates, and incarcerated people can take to assess, understand, and improve food systems in their own facilities. The goal of this report is to encourage more discussion about prison food in order to more deliberately include this key dimension of the human experience in correctional programming. The full report can be found at http://www.euro.who.int/en/health-topics/health-determinants/prisons-and-health/publications. My mother’s house is located at the end of a country road that is lined with cranberry bogs. Acres of ancient sprawling bushes, native to the land, sit on either side of the concrete lane, silently reminding us that we are only passing through. 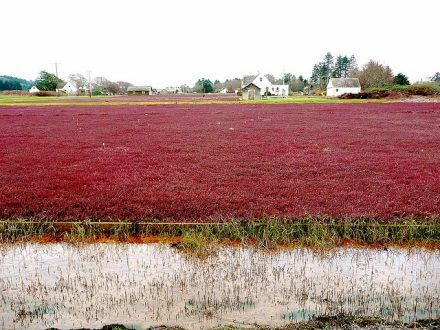 During the fall harvest, the bogs are flooded to gently shake the berries from the branch. By December, the water on the bog is usually frozen, keeping the bushes safe until spring, and the berries have found their way to our tables. For me, there is no holiday without a mound of bright cranberry sauce in the middle of the pale plate of turkey, mashed potatoes, and bread stuffing. Bitter some years, sweeter in others, sprinkled with the occasional orange rind or clove to be avoided. For my family, cranberry sauce is not simply a form of caloric sustenance, it is nourishment. This sauce represents our shared identities and the place from which we have grown. Around the world, stories like this about food and identity, food and relationships, are universally understood. A plate of black-eyed peas on New Year’s Day, Auntie’s warm dal with extra cumin, a grilled piece of meat in summer, a small hard candy in a glass bowl by the window. We all know what family and friendship tastes like. Incarcerated people are no exception when it come to the idea of using food to create identity, relationships, and place: the inability to control what, how, when, and with whom one eats is one of the most acutely felt pains of imprisonment. Download Food Systems in Correctional Settings: A Literature Review and Case Study (WHO Europe, 2015). Authored by Amy B Smoyer and Linda Kjær Minke. The 2016 edition of PRI’s annual publication, Global Prison Trends, includes some data gathered on prison food budgets from selected countries. Available from May 2016. Amy is Assistant Professor at the Department of Social Work, Southern Connecticut State University (USA), and co-author of WHO Europe’s new report on Food in Correctional Settings.